With its system Shimano Steps mid-engine, and its drivetrain Shimano Nexus 7 speed, the eC02.200 is perfectly suited to urban journeys. 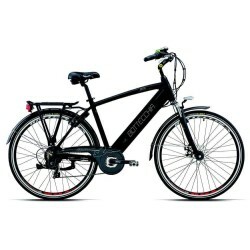 The electric bike EC02-200 Peugeot 2015 is equipped to this version, an engine-driven system SHIMANO STEPS, which is a central engine which has just arrived on the market . It is one of the engines at the crank the least expensive. It is equipped with the transmission Nexus 8-speed.